Annie and Snowball enjoy a day with Dad in this sweet story that’s just right for beginning readers. Annie can’t wait to spend a special day with her dad. With her pet bunny, Snowball, choosing the route, the day is bound to be a grand adventure with loads of surprises! Perfect for Father’s Day or any day, this Level 1 Ready-to-Read story celebrates the special bond between daddy and daughter. The Let’s Go! chapter starts off with a great image of children playing outdoors on a summer day. Ask your child what activities he sees in the picture and then ask him what his favorite outdoor summer activities are. 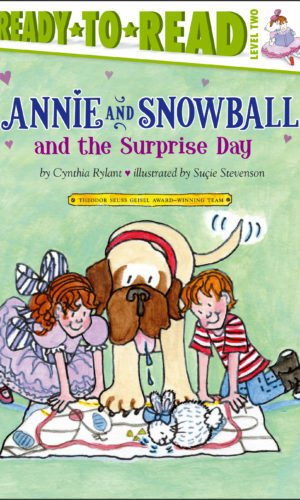 When Annie’s dad tells her he has a surprise for her, what do Annie and Snowball hope the surprise is? When Annie’s Dad, Annie, and Snowball get in the car, how do they decide where they are going to spend the day? While the three of them explored Highway 24, they have a fun time in the car as they drive to their picnic destination. What did they see and do while they drove? When Annie arrived back home, she went to visit her cousin, Henry, to tell him about her day. What do you think were Annie’s favorite parts of the day? This book is a wonderful example of what spending a day outside together as a family can look like. It could really encompass any type of activity. You can see that Annie’s Dad didn’t really have a plan but instead together, they were enjoying each other’s company and that was the most important part of the adventure. You can get your child’s creative juices flowing by asking them if they could be a day-tripper, like Annie, where would they go and who they would like to go with. If possible, make a day out of it!